Spring break: If those two words evoke a shudder -- or a flashback -- you're probably too old to enjoy its bacchanalian madness. And it can get pretty crazy, engulfing normally lovely vacation spots for a while. While spring break dates vary from school to school, most spring breaks are scheduled between early March and the beginning of April. "Over 100,000 American teenagers and young adults travel to Cancun over their Spring Break each year." 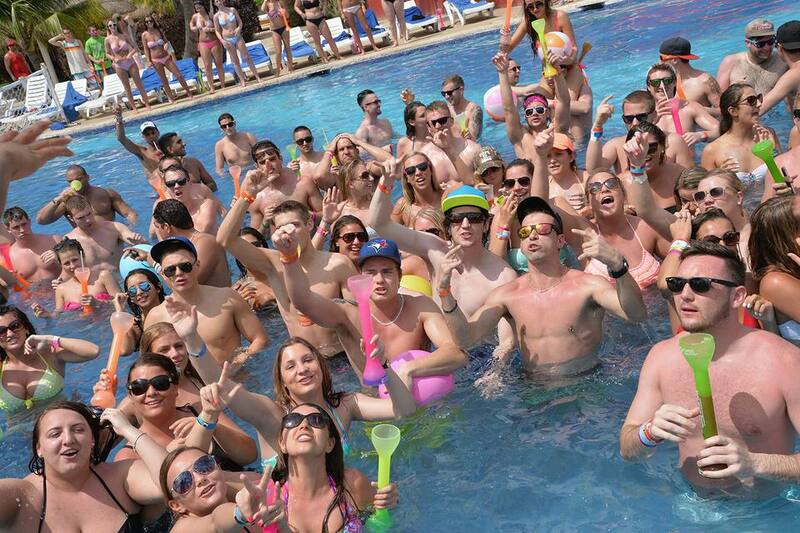 And if you've ever seen the movie The Real Cancun, you've witnessed how spring break boozing and cruising can get out of hand in places that draw monster-sized crowds of college-age students eager to cut loose. Where do the giant spring break crowds flock? To warm places where cheap lodging is plentiful. If your vacation happens to fall during spring break and you're traveling to one of these destinations, you can still avoid some of the hysteria. Make reservations at one of the better hotels in the destination, where the management doesn't look kindly on accommodating four or more to a room. In addition, there are numerous cruises that depart during spring break. If you're thinking of sailing during that period, check with a travel agent or the cruise line before you book to determine if a certain cruise will be filled with spring breakers... and consider choosing another line, a longer itinerary or a ship that avoids popular ports in Mexico or the Caribbean. Where Can You Escape from Spring Break? Oh, Canada, civilized neighbor to the north! Instead of heading south to the beach and blazing sun, look north to explore a culture similar to ours but just different enough to provide an exotic thrill. It's easy enough to reach; just be sure that you have acceptable ID—a valid U.S. passport, passport card, or NEXUS card if you're driving. If flying, only a passport will do. Coast to coast, Canada's provinces have distinct appeal. If you head for her Maritime Provinces—New Brunswick, Nova Scotia, and Prince Edward Island—expect to feast on a bounty of the freshest seafood you've ever tasted while exploring a slower way of life. Indisputably the most romantic province of Canada, Quebec is home to Montreal (where the Queen Elizabeth Hotel just reopened its John & Yoko suite (where the couple held a honeymoon bed-in for peace), rustic Charlevoix, and fortified Quebec City. Canada’s third largest city, Vancouver has it all: On the ocean and framed by snow-capped mountains, it's heaven for outdoorsy couples. There's also a diverse food scene, a great selection of romantic hotels, shopping, and plenty of parks and beaches. Since most college students aren't seeking culture and history on their spring break, the great European capitals are a safe choice for adults. London is a thrilling city to explore, Paris is exquisite, and Rome is timeless. If what you really want is a beach without Rabelaisian misbehavior, you can sun yourselves in the south of France, along the southern Italian coast, along Croatia on the Adriatic, and of course on the islands of Greece. Known to attract older travelers since they have no facilities for children, a river cruise one could be your best bet at this time of year. Sail the Danube or the Rhine or choose a tulip-themed one that starts and ends in Amsterdam. March and April are when the flowers are full bloom, and seeing them vast and resplendent at the magnificent Keukenhof Gardens will become a memory to last a lifetime. There's something about cities, perhaps because they're places that a majority of adults live and work in, that don't lend themselves to immature free-for-alls. Visiting a city on spring break can give college students a window into the next phase of life. And couples who are years post-college can enjoy the sophistication of a world-class city such as Boston, Chicago, and San Francisco. Down south, Savannah, Charleston, Asheville, and Lexington, Kentucky maintain a sense of decorum. Those three destinations afford a look back in history and a slower pace of life. Another way to avoid the maddening crowds is by taking a driving vacation off the beaten track, avoiding major highways and population centers. Plot your route in advance, and make reservations a head of time for overnights in romantic inns along the way. Does Every College Student Go Wild During Spring Break?